Free P2P VPN software - Wippien. Easy gaming. . Easy file sharing. . Easy chatting. . with your real buddies! Wippien can establish direct P2P (peer to peer) VPN between each contact. You will be assigned an IP address to enjoy full network services with your friends - just as they would be sitting next to you. No special setup is needed to establish connection. Wippien uses NAT traversal techniques to penetrate NAT devices and make direct connections between peers. You can access your friends' shares, printers, services, desktop, even ping them through IP you see next to their name. Wippien uses popular WeOnlyDo wodVPN component to establish P2P between peers, and then simply redirects all traffic from Virtual Network Adapter through wodVPN to remote side. Easy, eh? With this fully featured IM Client you can exchange messages and files, have visual and audio notifications on new events, change its appearance - all in one product! 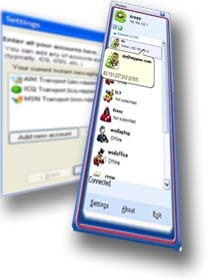 it can connect to ICQ, MSN, Yahoo, AIM, Jabber, Google Talk and many other protocols! Not only it is FREE, you can even obtain its source code. You can download and use Wippien for free, both for personal and commercial usage. If you like Wippien, you can adjust or rebrand it to suit your needs. Source code is available. Wippien uses several 3rd party components which needs to be licensed separately. Note that you still need to obtain licenses for those components if you plan to rebuild Wippien on your own.